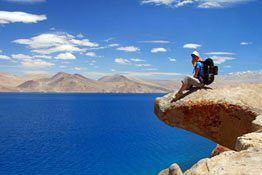 Get a chance to go on a nomadic voyage on a picture-perfect luxury while unfolding the centuries-old Ladakh’s culture, visiting its serene monasteries with stunning ancient art, captivating monuments, and attending fairs and festivals. Attend the ancient Polo sport match that was brought here in the 17th century and be a part of the unique rituals of the area. Partake in archery, amidst beautiful vistas. 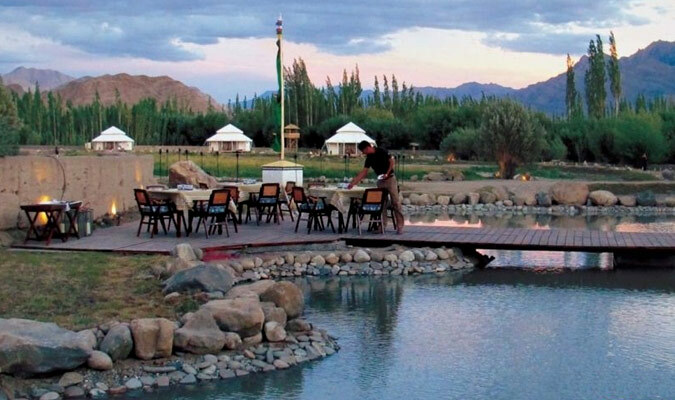 Have lip-smacking meals at the banks of the Indus River after enjoying rafting in its placid waters. Chamba Camp package of 7 nights and 6 days lets you experience splendid things in Ladakh. 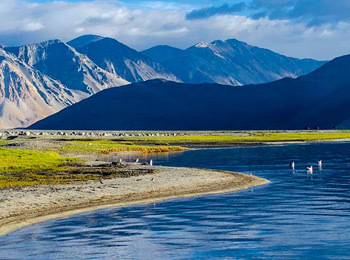 Ladakh is a visual treat with ice-clad mountains, crystal-clear lake, barren white deserts and verdant valleys. Set amid the Himalayas and the Kunlun mountains, this region is like a dream. 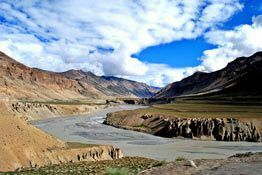 Leh, the capital of Ladakh, is one of the best places that you visit during the itinerary, along with Thiksey, Turtuk and Nubra Valley. Stay in camps in Thiksey and Diskit. Leisure walk to admire the wonderful scenic beauty. 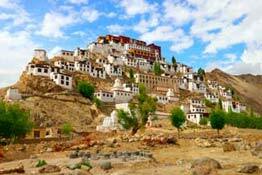 Visit to the popular monasteries of Ladakh- Thiksey and Alchi. Diskit Gompa and Chamba Gompa in Hundar village. Explore the wonderful hamlet of Turtuk. Trip to village Thiksey, a séance session, rafting in River Indus (optional). Try your hand at archery and attend a Polo match session. 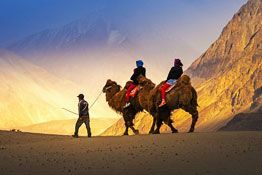 Explore the sand dunes of Nubra on a double-humped camel back. Morning arrival in Leh. Meet our tour representative who helps you with an assisted transfer to the Chamba Camp, Thiksey. Complete the check-in formalities and settle in your well-appointed luxury tents. Savor the tranquility that spread all around you. On this day, no activity is scheduled as according to medical norms, one should simply relax and acclimatize before going up on higher altitudes. The Excursion Specialist at the Camp, Thiksey discusses the itinerary and also assists you in planning your excursions. Overnight stay at the Camp. The morning is at leisure. Have your breakfast. Now, you can take a leisure walk around the camp area, savoring the lovely sights and sounds of poplar trees. The natural beauty and serenity here are matchless. Or, if you are one who those who leave their beds early, you can opt for an optional bird watching tour accompanied by a naturalist who helps you in spotting as well as identifying several kinds of birds in the Trans Himalayan area. Lunch is followed by an orientation tour of Ladakh, around 19 km from the camp site. The visit of the day is to the very popular Leh Palace. Commissioned in the 17th century by King Sengge Namgyal, this almost ruined palace has 9 storeys. Some parts of this palace are fine specimens of typical Ladakhi architecture. Now, on-foot continue to Ladakh Arts & Media Organisation Center, walking past some nice-looking old houses. This centre is placed in Munshi (Togoche) House, one of the most important heritage houses, lying at the base of Leh Palace. From the terrace of this house, treat your eyes to the wonderful old city views while sipping your tea, served with light snacks. Explore the heritage house, finally heading to the local bazzar. The day ends at Shanti Stupa, lying at a great point over the Leh town, boasting of breathtaking views of the landscape. Admire sunset views while sipping the traditional Ladakhi butter tea. Back to the camp for Overnight stay. Sip tea and coffee early in the morning and head to the Thiksey Monastery, just a km away from the camp. This monastery is the sight of 2-stroied high statue of the Maitreya Buddha, seated on a lotus. Attend the Morning Prayer ceremony at sunrise here, surely a lifetime experience. The guided tour of the monastery now takes you to the huge prayer room with several painted and handwritten books. Next, you visit a temple, dedicated to Goddess Tara. The temple has 21 photos of the goddess on wooden shelves with glass covering. There is a few smaller shrines dedicate to various guardian deities including the protector deity of Thiksey, Cham-Sing. Back to the camp for breakfast. The rest of the morning is at leisure. Indulge in the activity of your interest. Or, you can go for an option cycling trip to the Thiksey village and its surroundings. Or, you can also drive to village Saboo for a séance session, headed by the Oracle (This option would be confirmed a day before, if the oracle wishes to meet the audience). Or, you can also mix combine your Alchi visit with an optional rafting expedition. In the morning, start driving past the pastoral countryside, reaching the put-in point. Enjoy river rafting in the Indus River, cruising past traditional villages and enjoying the views. Do not miss noticing the contrast between the green patch of village Nimoo on one of the banks and completely barren landscape of the other. Rafting is followed by a lunch at the Alchi Monastery. Overnight in the Thiksey Camp. Post breakfast, the day would be spent in exploring some of the most dream-like and enchanting landscapes of the region. 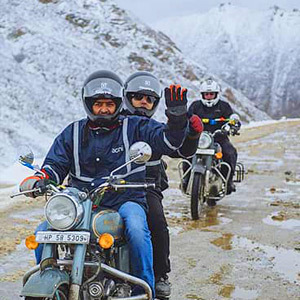 Drive the one of the world's highest motorable passes, the Khardung La Pass (5580 m). This road is the entry point into the Indus Valley with lush vistas and a mélange of willow and poplar trees. Later, enjoy a picnic lunch at Khalstar village. 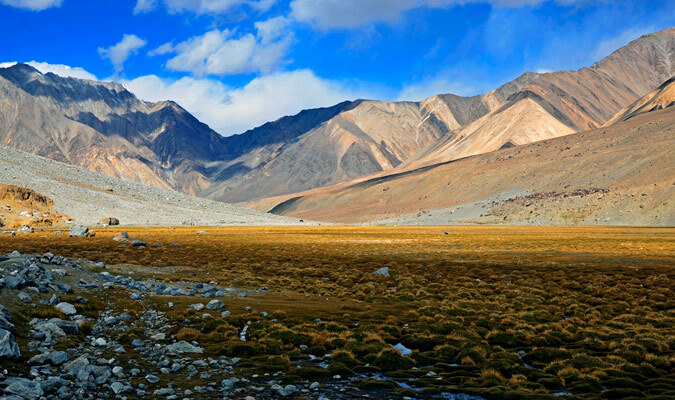 Continue your road journey to the sand dunes of Nubra valley. Arrival at Diskit village and check into the camp. Enjoy an afternoon visit to Hundar village. Keep walking on the narrow walkways, appreciating the lovely old typically Ladakhi houses. Here, you visit a monastery that is known for its monastic heritage- Chamba Gompa. Later on, head to Diskit Gompa that is placed on a hill. Belonging to the Gelugpa (Yellow Hat) sect of Tibetan Buddhism, it is the largest and oldest Buddhist monastery of the Nubra Valley. A sub-gompa of the Thiksey monastery, it comprises of a huge drum, statue of Maitreya Buddha in its prayer hall and several photos of ferocious guardian divinities. Overnight stay in the Camp. On day 5 of the tour, have an early morning breakfast and start an exciting road journey, passing through the mesmerizing landscape taking you into the land of Balti dynasty, in its Turtuk village. The traditional houses of this tiny hamlet are known as Nangchung with unique old-style kitchen tools and excellent-quality apricots grown here. Enjoy picnic lunch. Back to the camps. Stay overnight at Chamba Camp of Diskit. Overnight at Chamba Camp, Thiksey. This day is at leisure. You can just relax or can partake in the activities of your interest. Or, there is another option too. You may pick an option of exploring the Wari La. The fourth-highest motorable road in the world, it is one of Ladakh's most picturesque passes. 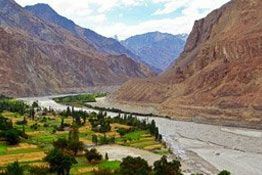 Connecting two most-visited and most breathtaking valleys in the Trans-Himalayan region, this pass offers magical views of many villages of the Indus valley and the Nubra valley. An alternative route into Nubra, it was started in the year 2008. Halt for a tiny safety briefing and then you start cycling to probably the best track of the Himalayas in Ladakh. This road traverses through the lush patch of the village of Shakti. The trip ends here. Back to the camp for lunch. Otherwise, you can also opt for a rendezvous with the local oracle. Buddhists very strongly believe in the impact of the spirits in this world and hold them of high importance before they are starting any important activity or a new venture. The lamas of the monasteries play the role of mediators between the spirits and the humans. Along with performing the rituals related to the gods, they are become oracles and astrologers, giving predictions on taking the harvest, going to a journey, starting any new work, an arrange marriage etc. You may choose to visit the Oracle's village for a séance session. Today is the last day of the tour. Get transferred to the Leh airport, and go on- board the flight for your onward destination.